Cambodia is a great country for an extended visit, but what options are available if you plan to stay long-term? The good news is that it’s very easy to get a long-term visa for Cambodia, and at the moment it’s also easy to stay indefinitely. If you’re planning to visit Cambodia, you have two visa options. The first option is to get a tourist visa. If you’re planning to stay for less than 30 days, then this is the visa you need to get. This visa costs $20 and is either available in advance or on arrival (for most nationalities, including USA and UK). With this visa you are allowed to extend your stay once for an extra 30 days at a cost of around $45. Your hotel in Cambodia will be able to arrange this for you. If you’re planning to stay for longer than 60 days, then this visa isn’t suitable. The second option is to get an “Ordinary” visa (formerly known as a business visa). As with the tourist visa, this is also valid for 30 days, and costs $25. But the beauty of this visa is that it can be extended indefinitely. And the other great thing about it is that you can extend your stay from within the country, so there’s no need to leave. You have the option to extend for 1, 3, 6 or 12 months. With the 1 and 3-month options you will only get a single entry visa, which means that if you take a trip out of the country, you’ll need to get a new visa when you return. Much better is to get either a 6-month or 12-month extension, as they will both give you multiple entries, which means you can leave and return as often as you want on the same visa. 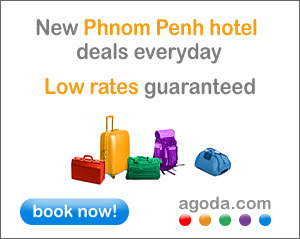 If you’re planning to visit Cambodia, then check out the Agoda link below for some great hotels at great prices.